This creative colouring book is the perfect companion to the best-selling The Little Book of Mindfulness. 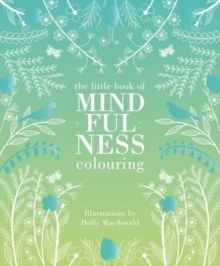 The Little Book of Mindfulness Colouring includes line illustrations of the natural world - from flowers and trees to butterflies and birds that are specially designed to be coloured in - alongside a collection of 50 inspirational quotes that will enable you to still the mind and relax the body, whilst generating and boosting a feeling of well-being and contentment that will permeate every aspect of everyday life. The perfect gift to bring lasting happiness and peace for friends and family. This is a practical way to relax the mind, whilst subconsciously developing self knowledge, expanding the imagination and nurturing creativity.